Hedcuts are hand-drawn, pen and ink illustrations, developed by the staff artists at The Wall Street Journal. The technique resembles the old style engravings, and it gives the Journal its iconic look. The term "hedcut" comes from a newsroom abbreviation for "headline cut." "A-hed" is The Wall Street Journal's funny column located at the bottom of the front page. The story is either quirky or light in nature and almost always features a hedcut drawing. WSJ. Magazine is a luxury glossy, news and lifestyle monthly magazine by the publishers of The Wall Street Journal. The magazine is distributed within the U.S. Weekend Edition of The Wall Street Journal newspaper, the European and Asian editions, and is available on WSJ.com. A number of columns throughout the magazine feature hedcut drawings, most notably the “Soapbox” page, with 6 columnists’ hedcuts. Favored by corporate clients, hedcuts help businesses stand out by presenting an appealing professional image to the public. Hedcuts add a touch of class to a variety of uses in marketing, branding, and product design. 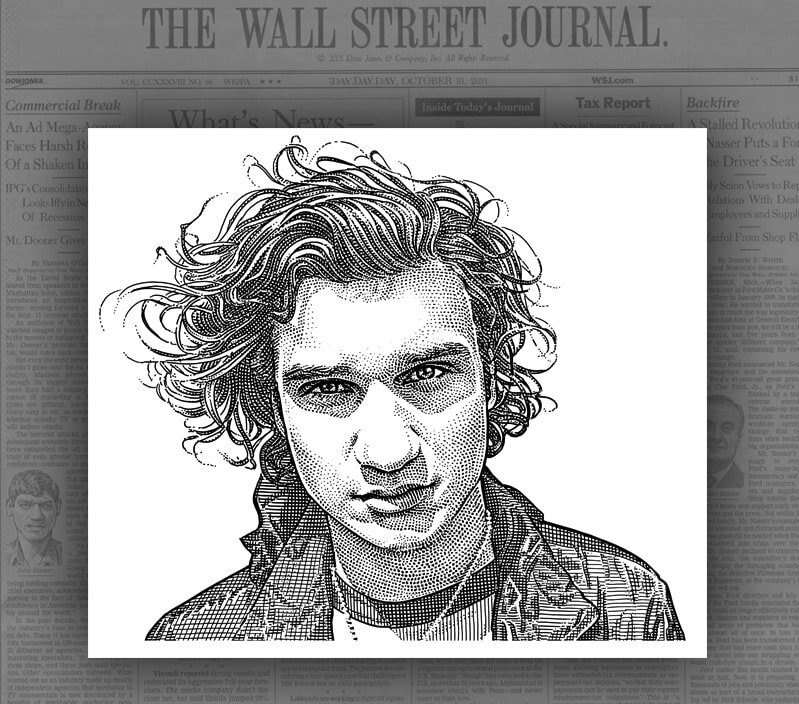 Used as columnists’ portraits throughout the WSJ, the so-called “mini hedcuts” double as social media avatars.